07.09.15 :: Categories: Preserve River Ecology. Tags: dead sturgeon, Endangered Species, Hudson River construction, and Tappan Zee Bridge. News Types: Press Releases. OSSINING, N.Y. – Riverkeeper, represented by Pace Environmental Litigation Clinic, petitioned the National Marine Fisheries Service today to investigate and take immediate action in response to a shocking spike in reported sturgeon mortalities in the Hudson River estuary since the 2012 start of the new Tappan Zee Bridge construction project. 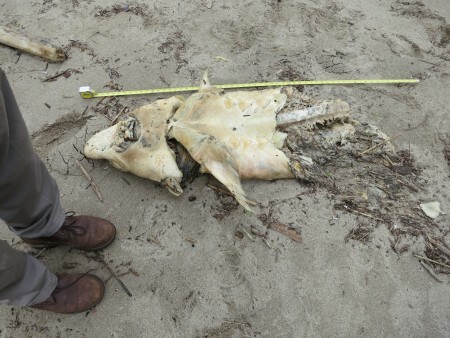 In the three-year period before construction began – 2009 to 2011 – a total of six sturgeon fatalities were reported throughout the estuary to the New York State Department of Environmental Conservation. In the three year period after construction began – 2012 to 2014 – there were 76. 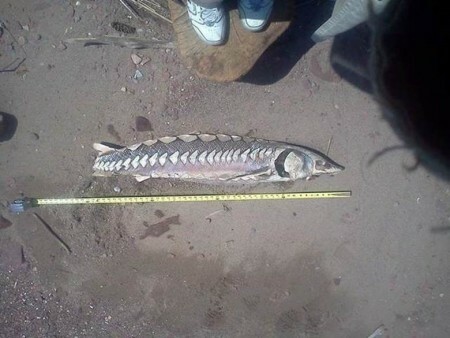 In many cases the sturgeon were found cut in half, gashed or severed at the head or tail due to vessel strikes. 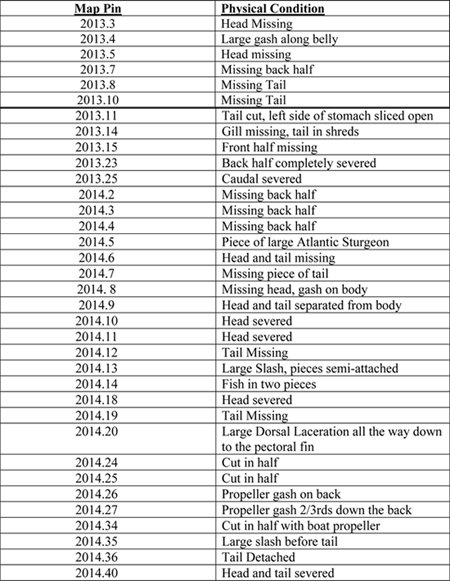 Dozens more sturgeon mortalities have been reported to the DEC in 2015, bringing the total to over 100. The dramatic increases coincide with the start of pile installation testing in 2012; the massive dredging and pile driving work that began in 2013; and the ongoing bridge construction, involving close to 200 project vessels in and around the Tappan Zee. 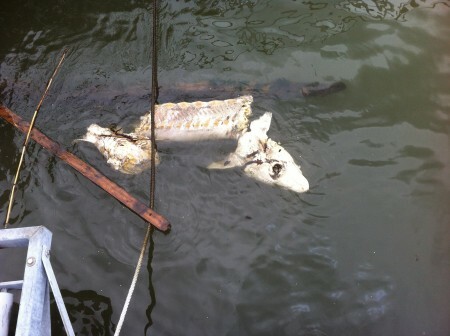 Between Crotonville and Riverdale alone, 10 and 13 sturgeon mortalities were reported in 2013 and 2014, respectively. Riverkeeper noted in its petition that the Hudson River estuary is tidal, meaning a dead or injured fish could be transported north or south of the project area on the tide. Moreover, a sturgeon injured as a result of project activity might travel some distance before it ultimately dies. Riverkeeper seeks immediate, interim measures to protect endangered populations of shortnose and Atlantic sturgeon from the construction activity. The National Marine Fisheries Service, part of the National Oceanic and Atmospheric Administration, reviewed the bridge project as part of its responsibility to protect endangered species. The service issued an opinion in 2013 that the Tappan Zee Bridge replacement project “is likely to adversely affect, but not likely to jeopardize the continued existence” of endangered populations of Atlantic and shortnose sturgeon. It concluded that dredging or pile driving would likely cause the deaths of two shortnose sturgeon and two Atlantic sturgeon over the entire course of the project. That toll is deemed the project’s “allowable take” permitted by NMFS and the DEC. If even one sturgeon mortality were caused by a project vessel strike, that would exceed the project’s allowable take. With data suggesting that the permitted threshold has been grossly exceeded, Riverkeeper petitions the Fisheries Service to re-initiate consultation on the project, analyze the causes of death and take immediate steps to lower the risks of sturgeon fatalities. Such steps – to be determined by the Fisheries Service and the appropriate specialists – might include enforcing the 5 mph speed limit in the Tappan Zee construction zone; requiring propeller cages on deeper draft tugs and push boats; doubling the size of “bubble curtains” used to control damaging shock waves from pile-driving, and requiring that dredge buckets be lowered slowly to allow fish more time to escape. Much of the project area north and south of the existing bridge is in very shallow water, putting sturgeon in close proximity to the vessels and propellers. “Seeing that such a large percentage of dead sturgeon have been struck by a vessel, slowing down all vessels in the construction zone would appear to be a practical, immediate precaution which would give the sturgeon more time to detect and avoid the propellers,” Riverkeeper Patrol Boat Captain John Lipscomb said. Riverkeeper continues to monitor the Tappan Zee Bridge construction project to ensure it complies with terms meant to protect the health of the river. In 2013, Riverkeeper and Scenic Hudson reached an agreement with New York State that included strict standards for dredging and other in-river construction, environmental monitoring and funding for restoration projects. In 2013 Riverkeeper documented poor dredging practices, later corrected, that threatened to contaminate the river. In 2014 Riverkeeper alerted the DEC to illegal construction at a Tappan Zee Bridge staging area in Coeymans, resulting in a $10,000 fine against the company and $55,000 payment toward an environmental project.